We watched The Phantom of the Opera at the Cultural Center of the Philippines last week. D4 was actually the first one to see the musical and since she was all praises on the show, she took it upon herself to scour for discounted tickets. 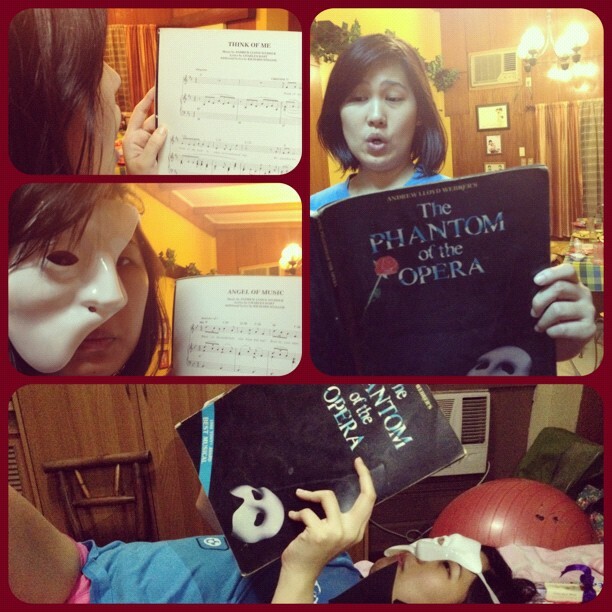 The first time D4 watched Phantom, her ticket cost 7,500 php. The second time around, she was able to get 40% off on the tickets as she bought them 2 days before the show. Yes! D2, D3, D4 and I felt good with our discounted tickets. Was The Phantom of the Opera worth it? Oh definitely. The musicality of the cast, the superb orchestration and direction, the magnificent stage props and costumes all contributed to the excellence of the presentation. Bravo! Jonathan Roxmouth. See the pictures on the left? That's D4 in her "Phantom" mode.